During Meier’s Great Journey in space described in Contact Report 31, which took place from July 17-22, 1975, he allegedly traveled to a parallel or twin Universe called the DAL Universe in a Plejaren mothership called the Great Spacer. In order to transfer from our DERN Universe to the twin DAL Universe, a tunnel-like portal or gateway called a Universal Barrier was artificially generated. His return journey from the DAL Universe through the Universal Barrier is described in Contact Report 32. Before traveling through the Universal Barrier to the DAL Universe Meier took a picture of it. In PPKB 1, Meier published Contact Report 31 which contains information on the Universal Barrier along with the following picture (below color version is from ‘And still they fly’ since only black & white versions of the pictures were published in PPKB). This picture is a part of the collection of 42 space photos of which around 2001 ‘it was strictly ensured, with the help of Ptaah, that it only concerned “Billy’s” genuine pictures or his pictures that were only slightly falsified’. We do not know exactly when Meier’s Universal Barrier picture became publicly available, but for our investigation we will take the date of alleged photographing (July 17-18*) of the Universal Barrier as the reference point. *The Great Journey took 5 days: from July 17 to July 22, after which Meier and the Plejaren supposedly traveled back in time to July 18, to bring Billy back to Earth, as becomes apparent from an excerpt from the witness testimony ‘Eine merkwürdige Bartgeschichte’ (A remarkable beard story), written by Guido Moosbrugger for Jacobus Bertschinger, first published in Stimme der Wassermanszeit, Nr. 71 (June 1989) and later in Zeugenbuch (2001). Col. Colman S. von Keviczky (1909-1998), an internationally prominent ufologist and Hungarian military scientist, founded ICUFON (Intercontinental U.F.O. Galactic Spacecraft Research and Analytic Network) in 1966. He originally published a report (see pages 114-120 of the book – Ausschnitte aus Zeitungen und Journalen) on the Meier case, which was sent to Wendelle Stevens and Thomas K. Welsch of Genesis III Productions, Ltd. on June 9, 1980. Perhaps as an addendum to the above June 1980 report or as a separate report (1980 or 1981? ), he published his analysis on Meier’s ‘Universal Barrier’ photo, which was reproduced in FIGU Core Group member Guido Moosbrugger’s book Und sie fliegen doch!/And still they fly! (1991, 2001, 2003 & 2012). Below a scan of the respective page from Und sie fliegen doch! (1991, German). In Contact Report 66 (Wednesday, November 10, 1976, 2:18 PM), Semjase (Plejaren ET) reports to Meier that several pictures, including pictures of Venus, Mars, Jupiter and the Universal Barrier, which both of them took during the Great Space Journey in July 1975 have been accurately imitated by artists to make drawings for scientific research and/or future demonstrations or futuristic representations. Semjase then argues that since Meier’s pictures already existed before these drawings were made later by illustrators, the irrationality of the Earth people will make them accuse Meier of swindle as the Earth people do not know how to think, act and rationally acknowledge the real facts. Semjase further tells Meier that he will be indirectly notified of these similar drawings the next day. Additionally, Semjase points out that the futuristic space colony picture was inspirationally transmitted (the receiving person is totally unaware of this process) to the painter by them ‘for the purpose that the people of Earth slowly get familiar with things, which will be created in the future‘. She further stated that there are some specific reasons for using the Universal Barrier picture to inspire artists, which however she was not allowed to mention. In 1988 the late James W. Deardorff, research Professor Emeritus (OSU), wrote an unpublished critique of Korff’s 1981 book (see above) titled Review of Korff’s Report: “The Meier Incident — The Most Infamous Hoax In Ufology. Based on the information apparently given to him by Wendelle C. Stevens, Deardorff suggested on pages 10-11 that Meier’s picture wasn’t a drawing as Korff implied in his report. He further suggested that Meier apparently never took a photograph of the real Universal Barrier and that he only made a comment on it being very similar to the illustration of a futuristic space colony published in a magazine, which he later photographed, and later it was confused by skeptics and critics as an original photograph taken or a drawing made by Meier, which he never did. To verify this information, Deardorff wrote to Meier/FIGU and got a response that Meier indeed took an original photograph of the Universal Barrier, thus implying that Wendelle’s information was erroneous, which Deardorff later conveyed to him. One might wonder why Stevens told Deardorff that Meier’s photo was a picture from a magazine, while in the Contact Reports (CR 66 and CR 68), of which Stevens himself published translations, it is clearly mentioned that Meier indeed took a photograph of the Universal Barrier. Meier case supporter David E. Chance published an article – “Billy” Meier’s “universe barrier” photo: research findings – in May 2005 in which he ascertained that the space colony picture that is identical to Meier’ Universal Barrier was an interior view of an Island Three design O’Neill cylinder that was originally painted by an artist named Richard “Rick” Guidice for NASA’s Ames Research Center in Moffett Field, California. Therefore, according to David, VonKeviczky’s question – “Who Owns The Copyright? “Billy” (Meier) or Dr. O’Neill?” – which he had raised in his analysis is framed incorrectly since the painting was made by Rick Guidice, not Gerard K. O’Neill. He further found out that some of Rick Guidice’s paintings were used in a 185-page document of a 1975 NASA Summer Study (10-week program from June-August 1975 with Gerard O’Neill as its Technical Director) titled “Space Settlements: A Design Study” (NASA SP-413), full text available online. The particular space colony illustration that resembles Meier’ Universal Barrier is found under ‘Cylindrical Colonies’ with the NASA ID Number AC75-1086, however this illustration’s appendix does not appear in the print version of the book. Did Meier photograph the space colony illustration from the report of NASA Summer Study, that was held between June-August 1975? According to David E. Chance’s research, the 1975 NASA study must have been published somewhere between October 1976 and April 1977, well over a year after Meier took his photograph in space in July 1975. He further notes that this painting also appeared in a book first published in 1977 by Dr. Gerard O’Neill, “High Frontier: Human Colonies In Space” and was registered for copyright in 1976 (see U.S. Copyright Office registration number TX-8-847), again several months after Meier took his photograph. So according to David, this validates Meier’s claim of photographing the Universal Barrier during his space journey in July 1975. His research was echoed by Michael Horn who then published it under the article – A Puzzle Where All of the Pieces Have to Fit – in his July 2005 newsletter. All the criticism provided so far as well as the rebuttals and counter-arguments provided by Meier, FIGU and their supporters will be addressed in the first two points. Various internal contradictions regarding the Universal Barrier picture were found that arise from the information in the FIGU literature and these will be addressed under the third point. At first, we will provide you with a little background and context on Rick Guidice’s painting. Also another artist, Paul R. Alexander drew this interior view of O’Neill’s space colony concept for the Science Year: The World Book Science Annual, 1976 edition, showing how one of the mirrors reflects sunlight through the space colony windows. Arthur C. Clarke published his novel ‘Rendezvous with Rama‘ in 1973, in which Rama is a fictional mysterious extraterrestrial vessel which is the subject and setting of the novel and its later sequels. This Rama ship seems strikingly similar to O’Neill’s Island Three design cylindrical space colony. Even before O’Neill, many scientists and writers have envisioned human space colonies since the 19th century. For the history of the idea of human space colonies, visit this NASA link. Below is a side to side comparison between Meier’s picture and Rick Guidice’s painting, also see this animation for a better comparison. It must be noted that the original painting is stretched in order to match Meier’s picture better, because indeed in Meier’s picture the center is egg shaped, while Guidice’s painting the center is circular, more on that later. Nevertheless, there are numerous remarkable similarities between both pictures, the red arrows point to some of those. The dark area towards the right edge of Meier’s picture is only visible on the picture published in Und sie fliegen doch! (2012 edition) but is missing in all previous versions of the Universal Barrier picture. It seems to be the same edge is also visible on other space pictures, which was argued to be the edge of the view screen Meier took his pictures from on his journey. Curiously, as can clearly be seen on the animation, this edge seems to match the edge of Rick Guidice’s painting. The differences between Meier’s Universal Barrier and Rick Guidice’ painting according to Semjase, Meier and FIGU are discussed below. 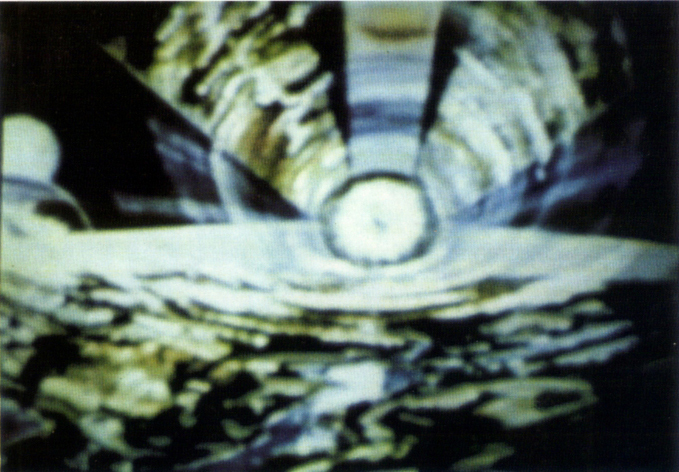 Semjase asserted that there are “stark differences” between the ‘rays’ (CR 68: ‘die Strahlungen’) or radiation streams that are coming away from the center of both images. She also pointed that in the foreground of Meier’s picture a “wavy, iridescent energy can be seen, while on the drawing a landscape is depicted”, which according to Guido is the greatest difference between both images. In Rick Guidice’s picture these ‘rays’, as well as the foreground part indeed, actually represent landscapes with trees, meadows, buildings, rivers, etc. 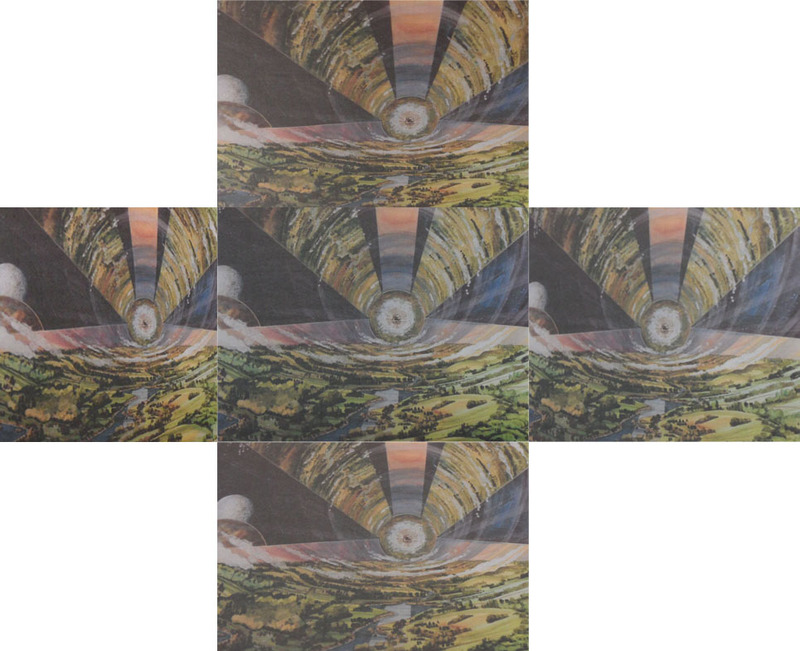 The other three ‘white rays’ (two at the left and right side of the bottom landscape, and one above the center) represent large light, planar mirrors that can open and close to create a day-night cycle inside the space colony (for clarification see this picture). The other bluish ‘rays’ are just reflections on the large windows of the space colony. The size of this cylindrical space colony design is 4 miles in diameter and 19 miles long. Due to this immense size and the perspective of the painting, buildings, rivers and other features (also present in the foreground landscape) on the upper landscapes aren’t very conspicuous, especially on a poor quality image of the painting. On a high-res image of the painting these features become more distinguishable. Yet, even considering the poor quality of Meier’s picture, when the features on the upper ‘rays’ are compared with the landscapes of the painting (see comparison picture above), there are numerous undeniable resemblances. Also many features of the mirrors and windows on the painting are very similar to the features on the corresponding ‘rays’ on Meier’s picture. Regarding the features on the foreground landscape/wavy energy there are also many similarities between both pictures, especially notice the reflection of the top mirror on the surface of the lake/river in the foreground landscape of the painting, which is also visible on Meier’s picture. It is not inconceivable that one would even recognize a landscape on the foreground of Meier’s poor quality picture, when one would not be aware that it is actually suppose to represent a Universal Barrier. It is true that in Meier’s Universal Barrier picture the center (with supposedly a space ship at it’s center) is oval or egg shaped structure, while in Rick’s painting it is circular. If both pictures are carefully compared, it will become apparent that not only the central part, but the whole picture is distorted (stretched horizontally among other things) correspondingly. The egg shape of the center certainly does not prove that Meier’s picture was NOT taken from the painting. If the possibility is considered that Meier’s picture was somehow taken from the painting, there are many mundane causes that could explain this and the other distortions. The angle and position of the camera relative to the picture, different film formats or different display or pixel aspect ratios or other distortions that usually occur during image copying and photographing procedures. Since the possibilities are many, it’s virtually impossible to exactly reconstruct what distortions could have caused Meier’s picture to look the way it does, if it was indeed taken from the painting. To illustrate the effect of one aspect we made photos of the space colony picture (color print-out) from different camera positions and angles* (see illustration below). We also tried to come as close as possible to Meier’s picture by only adjusting the camera position and angle and no other editing done. The result can be seen in this animation. According to the Plejaren/Meier/FIGU etc. the Universal Barrier picture was taken several months before the drawing of the interior view of the space colony was made and published in a magazine in early 1976 and more than a year before it was shown on TV on November 8, 1976. This according to them would constitute strong evidence for the explanation that inspirational-impulses were sent to sensitive human beings like artists, writers, producers, scientists etc. by the Baavi ETs to prepare the Earth people for the coming events, which would explain the similarity between Meier’s picture and the painting. Is it true that Rick Guidice’s painting was published only after Meier first photographed the Universal Barrier during his space journey between July 17-22, 1975? We checked the photograph archive database and the photographs in the AC75-1086 series were taken on 5/27/1975. So this means that Rick Guidice completed the painting before that date. A document containing a list of all dates and sources (newspapers, magazines, science papers, TV etc.) that have published the illustration (NASA ID number AC75-1086) made by Rick Guidice of the double cylinder space settlement interior between January 1975 and July 1975. The NASA press release from August 21 mentions a space colony film clip. However as we will see below, this video, or at least portions of it, was broadcasted globally much earlier. On July 23, 1975 O’Neill testified before the House Sub-Committee on Space Science and Applications, chaired by Representative Don Fuqua of Florida. 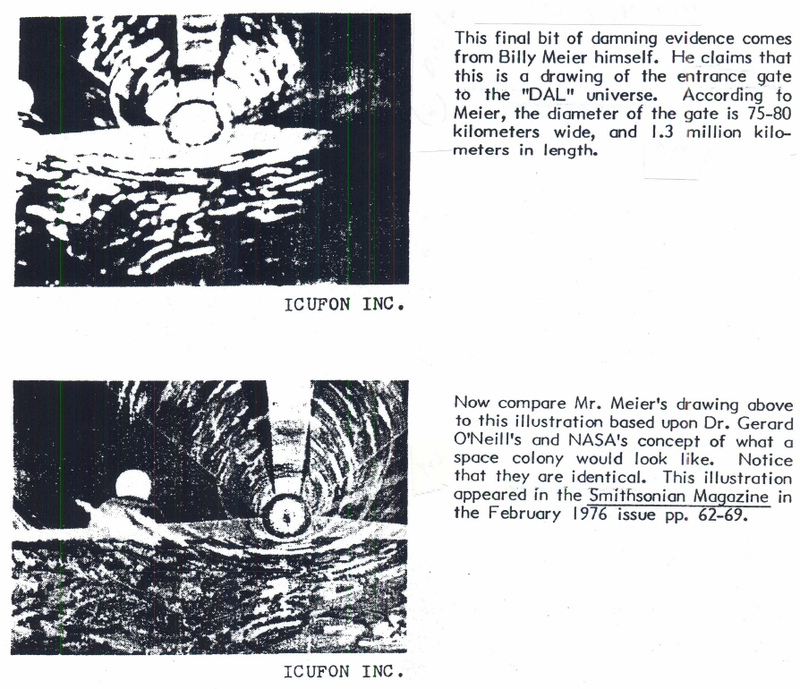 On pages 171-172 in the testimony, O’Neill stated that portions (likely include the Rick Guidice’ space colony picture) of the original 4 1/2 minute NASA video titled ‘Space Colonization‘, was already made and broadcasted globally in about 20 countries in the last week (July 14-20) before July 23. Mr. O’Neill: We need, of course, a first small colony, a sort of beachhead in space to start. Can the necessary basic ideas on how to build it be expressed quickly? The National Public Affairs Center for Television and Dolphin Productions in New York, with private money and a good deal of contribution of love, of their own, made a first try. Portions of their film were shown in about 20 countries last week on public television. I have the complete film here. It runs about 4 1/2 minutes, and with your permission, Mr. Chairman, I’d like to show it now. Mr.Fuqua: I’d like to see it. All of the above evidence clearly indicates that the interior view of the space colony picture painted by Rick Guidice existed and was published several weeks before Meier allegedly photographed the Universal Barrier. This clearly refutes what Meier and Semjase claim about the publication date of the painting. This painting, by Rick Guidice, was done in 1975 I believe. There is no question the TV image is of the artwork. I was contacted years ago on this subject and find it very interesting. There is no doubt in my mind it is a poor photo of the original I painted, most likely shot of the T.V. In retrospect wish I had dated it but even getting a signature on it at that time was bucking policy. I have looked through files in my studio and cannot find anything that pinpoints the date created. I do have old records in a storage facility but will take some time to get to them. If I find anything I will share it with you. P.S. For the record at the time I did not receive any telepathic E.T. images. Keep me posted on investigation. Here is a response from the NASA archivist. The art you referenced was photographed by NASA May 27,1975 and was created before that time. I hope this can help with your research. I managed to locate and acquire the painting in question a few months ago. I checked and, as you said, there doesn’t appear to be any date information on it. The NASA Ames photograph archivist says they photographed it on 5/27/1975 (NASA photo catalog numbers starting with AC75-1086). She says she remembers your paintings being photographed often while the paint was still wet, so it’s possible you completed it shortly before 5/27. According to Meier’s information, our entire Universe/Creation is divided into 7 regions or belts and we are located in the 4th belt (called the Material Universe) which contains all stars, galaxies, planets, nebulae, black holes, meteors, comets, gases, dark matter, and everything that contains matter and makes life possible1, 2. The other 6 belts either contain fine-matter or pure creational-spirit energy, no celestial bodies or life form or develop in these belts2, 3, 4, 5. In Contact Report 31 (Ptaah’ verses 174-176), it was mentioned that they need to travel to the last, outermost belt called the displacement belt where a barrier or tunnel is artificially created as a passageway to the DAL-Universe. According to the above references including the same verse 174 from CR 31, there should be no material objects present there at all, yet we see two spherical objects, presumably celestial bodies, to the left-side of the image, contradicting all textual sources on the subject. And of course there were no material objects in the „tunnel“. This implies that an image of the Universal Barrier was sent to Rick Guidice with the purpose of him making a picture of it in order to familiarize the Earth people with future concepts. However, he ‘misinterpreted‘ the image and turned it into a painting of a cylindrical space colony. This is also repeatedly implied by Guido. 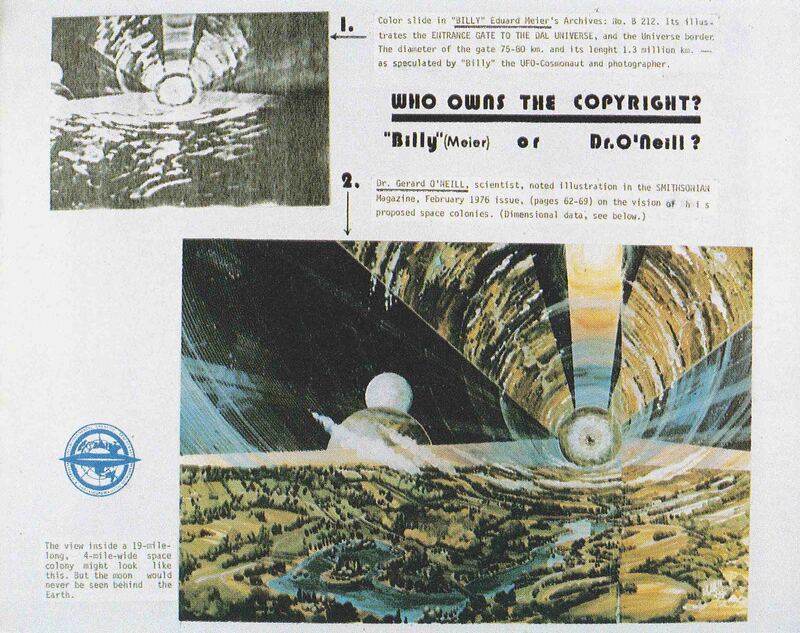 As already mentioned before, the concept of the cylindrical space colony was an idea of Gerard K. O’Neill. Rick Guidice and other artists were only hired to make illustrations of this idea. Also the features of the space colony on the painting, the landscapes, trees, rivers, lakes, clouds, windows and mirrors have logical functions. So there are perfectly logical reasons for why Rick Guidice made a picture of a space colony and not a Universal Barrier. Yet, according to Semjase he misrepresented the image transmitted to him and he was supposed to make a painting of a Universal Barrier, which conveniently seems to have a great number of very similar features as the space colony envisioned by O’Neill. To realize the absurdity of sending specific imagery as inspirational-impulses to more than one person (who will be totally unaware of it), visit this link and search the page for the word ‘inspiration‘. We have investigated the Universal Barrier (a tunnel into our twin DAL Universe) picture which Meier allegedly made on his Great Journey and which in around year 2001 was authenticated by the Plejaren ET Ptaah. 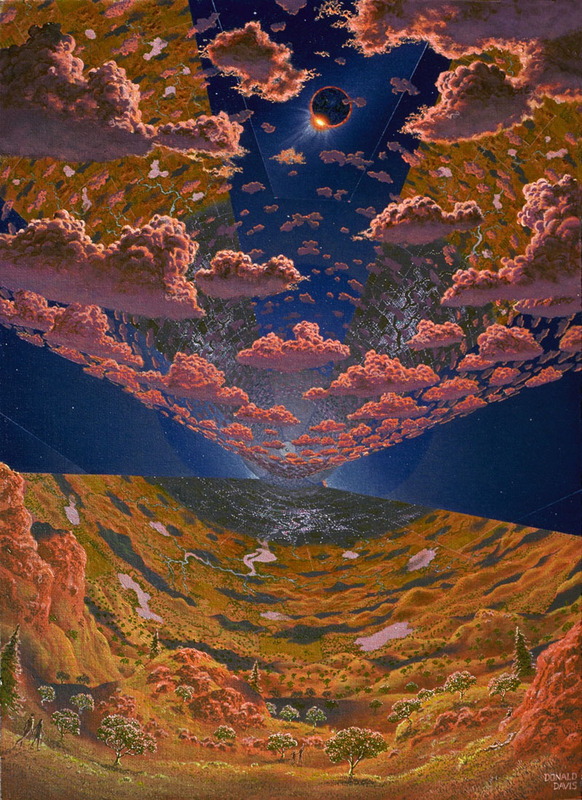 As already pointed out before by others, Meier’s picture is remarkably similar to a painting of a Gerard O’Neill’s Island III design cylindrical space colony made by an artist named Rick Guidice. Although compared to this painting, Meier’s picture looks distorted, there are also numerous of undeniably similar features. According to Semjase, Meier and FIGU this painting was made and published only after Meier made and published his picture. However, we found out that Rick Guidice finished his painting before May 27, 1975 and that this painting was also disseminated to the media and public through NASA press releases on June 16, 1975 (several weeks before Meier allegedly photographed the Universal Barrier between July 17-22, 1975) and again on August 21, 1975. There are also contradictory explanations in the FIGU literature for the similarity between both pictures, one explanation implying that the artist came in possession of Meier’s picture and made a (poor) imitation of it, another implying that the artist received an inspirationally transmitted image (from Baavi ETs) of a Universal Barrier, which he later misinterpreted as a space colony. Considering the fact that Rick Guidice finished his painting at least weeks before Meier allegedly made his picture, the first explanation would be impossible. The second explanation that Guidice received impulses of a Universal Barrier picture but misrepresented it as a space colony doesn’t make any sense because the only reason Guidice was hired by NASA was to make illustrations of space colony. Since the features seen in the cylindrical space colony envisioned by O’Neill like meadows, trees, rivers, buildings, clouds, mirrors etc. all have very logical functions and the notion that a Universal Barrier, which has a completely different function, would have very similar looking features seems rather absurd and far fetched.